We identified 32 different species of animals and algae -- all in just a couple of hours. 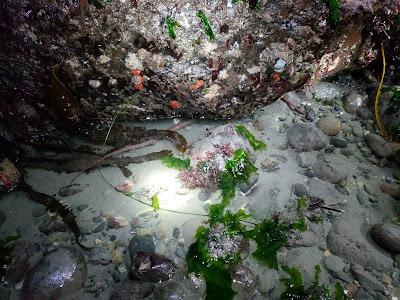 On Monday, Feb. 18, the Port Townsend Marine Science Center held a low tide walk at North Beach County Park to see what intertidal creatures get up to after dark. The event was a smashing success with the help of six wonderful volunteers. There were 51 participants who showed up to explore the beach at night. As they arrived, attendees were split into smaller groups of around 10 people and then sent with one of the volunteers to walk along the beach. 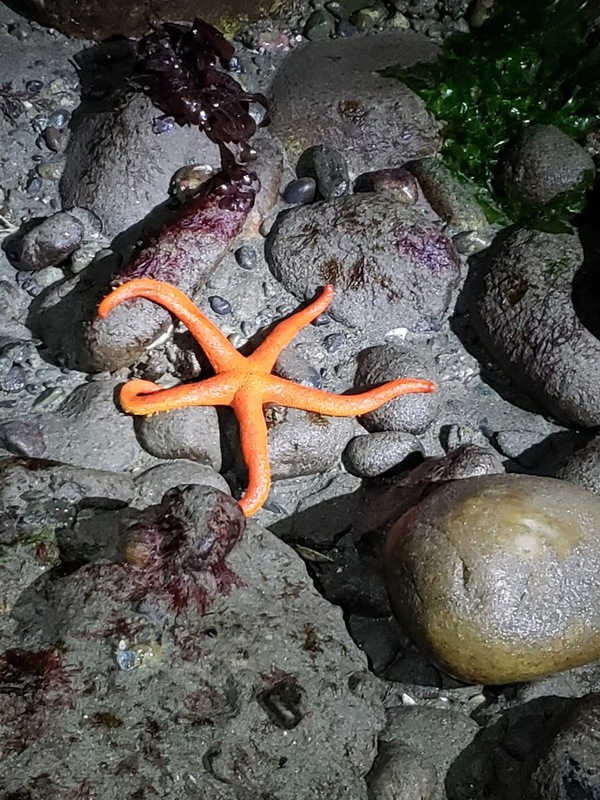 Low tide walks and tide-pooling are especially interesting because at low tide, a special group of organisms becomes visible. The usually-rocky area that one walks along at low tide is called the intertidal zone: The area that exists between low and high tides. It is underwater at high tide, but exposed at low tide. Because of the variability in water coverage, the animals that live in this zone must have adaptations that allow them to survive both in and out of the water (or in small tidal pools left behind a high tide) without drying out. The volunteers guiding the participants in Monday’s event found many different and interesting creatures. As a group, we identified 32 different species of animals and algae -- all in just a couple of hours. 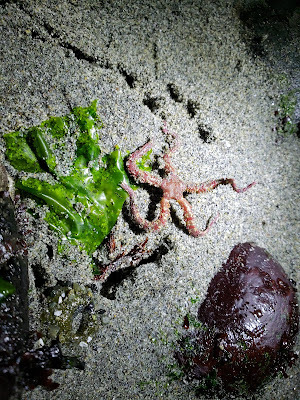 The list included small decorator crabs, clingfish, tidepool sculpins, lots of sea stars, and even a small octopus. 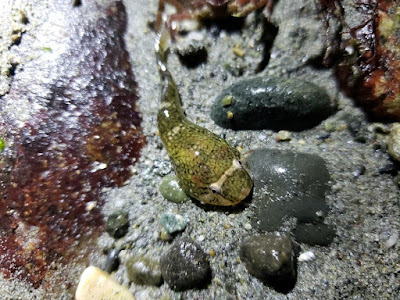 Northern clingfish (Gobiesox maeandricus). Photo by Katie Arbuckle. Brittle star (Ophiuroidea sp. ).Photo by Katie Arbuckle. Blood star (Henricia leviuscula). Photo by Katie Arbuckle. See the long, narrow, pink octopus tentacles under the rock? (Species unknown). Photo by Katie Arbuckle. PTMSC will schedule another low tide walk once the weather warms up a bit, and the low tides move to daylight hours. Written by AmeriCorps Aquarium Educator Marley Loomis.